Members of the 2015-16 YSU Moot Court team. Youngstown State University’s Intercollegiate Moot Court program ranks 11th in the nation, above schools such as Duke University, University of Virginia and University of Chicago. The rankings were compiled by the American Moot Court Association and are based on the average win total of teams over a three-year period. YSU ranks between California State University-Fullerton (10th) and Morehouse College and University of Texas-Dallas (tied for 12th). Virginia is ranked 16th, with Duke 19th and Chicago 23rd. Patrick Henry College in Virginia was ranked No. 1. 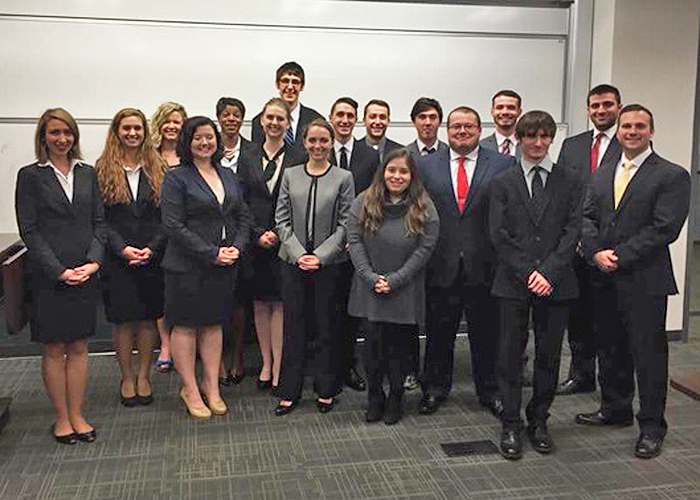 YSU’s Moot Court Team has qualified for the national tournament for the past seven years. Last fall, students competed in the Midwest Regional Moot Court Tournament in Wooster, Ohio. Ten regional tournaments with 360 teams were held throughout the United States. Only 80 teams were selected to go on to nationals, including two from YSU. At the national tournament in Long Beach, Calif., one of the YSU teams ranked among the top eight in the country. The team is coached by Paul Sracic, chair, Politics and International Relations. The purpose of the American Collegiate Moot Court Association is to educate undergraduate students about the American legal system, American jurisprudence, and the work of American attorneys. A Moot Court competition is a simulated legal argument before hypothetical appellate courts.